Seminary LXIII: that’s not in the canon, is it? Roy’s basic pitch was that, since we know that Gregory the Great was a dab hand with the Church canons, he must have taken time to think, when he plotted the mission to the English (in response, [Gregory tells us, to a local request after a failure to get religion from unspecified ‘neighbours’]) what the legal implications of it would be. Not least, he had a plan to set up twelve new bishoprics, but Britain had had bishops before, indeed apparently still did as St Augustine met with them to famous failure, and so there were sees notionally there that would have to be over-ruled and replaced. Roy pointed out that good precedents existed for this after the end of the Donatist Schism in Africa, where numerous parallel bishoprics and their properties had to be merged. This was regulated by the Council of Carthage in 418, which would certainly have been known to Gregory. Roy also argued that Gregory’s involvement of as many Frankish bishops as possible through letters showed an attempt to proceed in a quasi-conciliar fashion, to provide a better legal backing for the massive abrogation of existing rights (and rites) he was about to order. This he did rather than do what he might have done and declare the British Church heretical for Quartodecimianism; after all, as Roy pointed out, some of the Frankish bishops of the day thought the Irish missionary saint Columbanus was a heretic for this and other reasons, and the two churches seem to have been of one calendar on this. For me this was one of those seminars where I am asked to think about a topic I’ve not really considered deeply before, and then having done so I come away with a very different view from that of the person presenting. I thought there was a substantial elephant in the room here, and it was the Franks. Not only, as Roy admitted, has Ian Wood among others argued that the Franks exercised some kind of hegemony over Southern England at this time, the turn of the fifth to sixth centuries, so that not just the conciliar approach in which many Frankish bishops were involved but also the request from the vicini to assist their ongoing mission in England could be viewed in that context; but most of all, there is the rider of the aforesaid elephant, Bishop Liudhard who is supposed to have come to England with King Æthelberht of Kent’s Frankish wife. Roy didn’t mention him but for me he is a much more plausible explanation of the peculiarities Roy was mentioning. We know [that ‘neighbours’ of the English had been approached to provide Christianity, or at least we know that Gregory claimed this:] Roy favoured the British, but Bede outright denies this, though it has been suggested that he had to for his scheme of Anglian unity through conversion to work. Furthermore, the closest functioning British sees we know of at this time were Bangor and Carlisle—there are arguments to be made for Chester too—none of which are exactly ‘neighbours’ to Kent. Meanwhile, there’s an actual Frankish bishop restoring churches [at Canterbury]! Occam’s Razor… Also, this [could help] explain why Gregory planned the southern metropolitan to be London, not Canterbury; there was already a bishop in Canterbury! [Though, as I was forced to admit in comments, the actual chronology of the sources does seem to stop this idea working.] But Æthelberht seems to have had his own reasons for getting rid of Liudhard; we never hear of him again, Augustine moved in on his see [if see it e’er was] and London is never metropolitan, at least not in ecclesiastical terms. Then Gregory had to rearrange the situation, which may explain why, as Roy also admitted, he didn’t actually follow the template of Carthage in dealing with the British Church; things were already out of his hands, and the British may not have been the problem he had most immediately in mind. The obvious source material for Gregory’s intents on the mission has always been the letters between him and Augustine that Bede incorporated into his Ecclesiastical History, which is in the Internet Medieval Sourcebook as well as in your edition of choice, but Roy added Gregory’s letters into the mix and much of what he had to tell us that wasn’t widely known came from a close reading of them; they are edited in Dag L. Norberg (ed. ), S. Gregorii Magni Registrum epistularum (Turnhout 1982). Ian Wood’s arguments are most fully set out in an annoyingly unobtainable pamphlet, his The Merovingian North Sea, Occasional Papers on Medieval Topics 1 (Alingsås 1983), but there is also some coverage in his The Merovingian Kingdoms 450-751 (London 1994). Statistics: presented once, three drafts and two revision stages. Time from first submission to print: 2 years 6 months, though if I’d been marginally quicker with revisions mid-2009 that would have been 1 year 4 months, which is a lot more reasonable. Lessons: give print deadlines absolute priority, but also, stop doing proofs in a hurry or the typoes will plague you evermore. Help with some Cordoban Latin scuttlebutt? On the day of the Parasceve, indeed, while before—and not for long enough!—he had been far from the pontifical office in pursuit of evil intents, the new Judas Iscariot betook himself to Córdoba and, having cut his hair almost to the skin of his head, denying Christ to the Muslims, since he was already circumcised, easily clung to and afterwards took care of their rite after the priesthood. I think that’s pretty close to the Latin but what the goshdarn heck it actually means is another question. Is Samson saying that this guy did convert to Islam? or that he pretended to have done so before, and meanwhile operated as something administrative in the Christian Church as a kind of double agent? Whose priesthood? Islam doesn’t have an organised one in the way that this seems to imply, but the (grammatical) antecedent is pretty clearly Muzlemitis (and yes, it is interesting that he uses that word; elsewhere he uses Caldei, but more on that in a moment). If anyone can see through the grammar to work out what Bishop Samuel is actually supposed to have done, I would be grateful for your input. So, the whole thing does read as if he is trying to hide the political situation from his readers, or else somehow doesn’t think it very relevant. The problem he sees with the Church is corrupt and ill-educated priests and bishops, not the fundamental fact that it is in the power of Muslims. The Muslims are tolerable; they’re not really interested, but they’re amenable to reason as well as bribery, and the only really bad thing they do is subject the Church as a whole to tribute, but they only do that (as Samson tells it) because Servandus, Ostegesis’s right-hand man, turns over several Christians to the authorities for hiding things on which they should have paid regular tax under altars in the city’s churches, whereafter the authorities punish the whole Church.9 Again, somehow he blames the Christians, not the state. On the other hand, it’s what, era 901 he says so 863 AD, the Muslims have been in power in Spain for a hundred and fifty years and they’re only now putting the Cordoban Church under special taxation, as well as apparently being accessible to anyone even claiming to be a bishop and hiring hardline Trinitarian theologians to do secretarial work, so this attitude may be fair enough. All this makes it a very interesting source for the doublethink involved in being on the underside of al-Andalus’s well-known convivencia, but that doublethink is hard to see through. One can’t help seeing Samson as an ostrich with his head in the sand, however viciously he pecks at all the other ostrich’s feet. 1. Samsonis apologeticum contra perfidos, ed. Joan Gil in I. Gil (ed. ), Corpvs Scriptorvm Mvzarabicorvm Vol. II, Manuales y Anejos de «Emerita» XXVIII (Madrid 1973), pp. 505-658. 3. For example, he goes into unpleasantly gruesome detail about a struggle to remove the foreskin of Ostegesis’s octogenarian apostate father, driven to convert when arrested for non-payment of taxes (Apologeticum, II Præf. cap. 3). This is, I presume, damnation by association, as Samson puts some store by lineage, but there’s plenty of allegations of sexual impropriety too. I don’t like this kind of writing much, though I recognise it’s in a good Roman tradition; it seems so mean-spirited, condemning the accuser as much as the accused, and to diminish the force of the main accusations. On the other hand, I wrote much of this post while listening to the Dead Kennedies’ Plastic Surgery Disasters, which is, after all, an erudite, scathing and often scatalogical attack on people prostituting themselves to a corrupt and uncaring power structure, and which I enjoy thoroughly, so really, where’s that moral high ground I had a minute ago? 4. Samson, Apologeticus II Præf. cap. 2. 5. Ibid., II Pr. 4. 6. Ibid., II Pr. 2 & 8. 7. Ibid., II Pr. 8. 8. Ibid., II Pr. 9, inc. “illum quem gens Caldea profetam colunt“. 9. Ibid., II Pr. 5. Here is a much-delayed seminar report for you. On 9th March, already, Damián Fernández of NYU came to speak to the Cambridge Byzantine Seminar. 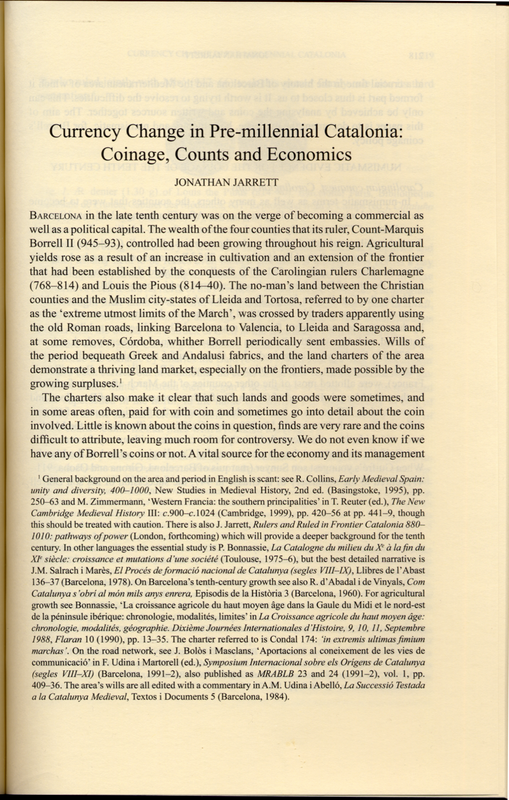 Since his topic was “Hilltop Settlement and Economic Change in Late-Antique Northern Iberia”, which isn’t Byzantine at all, it’s not entirely clear to me why that was, but it was of obvious interest to me (you’ve heard me mention hilltops here before, right?) and there are people in Cambridge I only see at the Byzantine seminar, so I happened along. Fernández’s answer to this was that this sort of question can’t be addressed from the archæology. The material culture doesn’t differ between areas that may have been outside the frontier and areas everyone is sure were in it; it’s not ethnicity, it’s just poverty. Okay, fair point, but we still don’t know what was going on. One thing that was going on, however, was wall-building, in the third century right through to the early fifth, not because of any particular threat but because walls are a prestigious thing to have round your late Roman settlement. They associate not with decline, but with wealth. He suggested therefore that fortified hilltop settlement (and indeed fortified lowland settlement, of which there is also lots contemporaneously) was not an aberration caused by military, economic or demographic crises but the new mode of settlement for the period, a cultural shift not a strategic one. He saw a state-driven change in the settlement network caused by, well, fashion as much as economy, though that too. This seemed somewhat circular to me, the state encouraging change in settlement morphology because lots of people have changed the morphology of their settlements because the state… I wanted to know whether these sites have rôles as burial centres, as my pet ones from later certainly do, but this didn’t appear to work here: apparently some do and some don’t, and almost none have churches. I don’t think I’d expect churches, actually, I think those would be more local until later, so this didn’t really get me anything. So, okay, there were a lot of small things here, and some quite big things, where I think alternative theses might be arguable or even preferable, but what I did like about this paper was his overall argument that these castella need to be seen not as crisis symptoms but as part of the same growth that is, at the same time that many of them are being refurbished (or even built, like Muelas below), causing the sprouting of new villas in the lowlands from third right through to sixth and in some cases seventh centuries. (Visigothic Spain was, after all, not apparently short of wealth.) Where the land is good for large-scale agrarian agriculture, you get villas; where it’s better for pastoralism and living on hilltops, you get castella—it’s environmental not military. That makes a lot of sense to me. The other important thing that he stressed is that, unlike the situation with hillforts like Dinas Powys in Britain, these are not aristocratic centres.4 There’s no evidence of resource redistribution, of patronage of craftsmen or of accumulation or special treatment of food animals (such as Alcock found at Dinas Powys); they’re just where people live, villages with walls. That’s so in the south, anyway; in the far north we know (from the slates!) that rents were collected at these places. Here a situation where control over transhumance routes is a source of power becomes more likely, even if the material culture, as said, is no different. Settlements are a decision taken by social actors: response to soc.-econ. change by e. g. state, moving to a more dynamic organisation of a local kind under a hands-off barbarian k’dom; aristocracies, intensifying local and decentralised econ. Good places to put walls! and I hope that shows that this is a guy with some big and powerfully explanatory ideas, which I’m sure I’ll meet again and which perhaps the readership might also find useful. 1. R. W. Burgess (ed./transl. ), The Chronicle of Hydatius and the Consularia Constantinopolitana (Oxford 1993), Hydatius cap. 81 rev. D. Fernández. 2. The most relevant reference that the handouts provide seems to be Carmen Fernández-Ochoa [& Ángel Morillo], “Walls in the Urban Landscape of Late Roman Spain: Defense and Imperial Strategy” in Kim Bowes & Michael Kulikowski (edd. ), Hispania in Late Antiquity: current perspectives, The Medieval and Early Modern Iberian World 24 (Leiden 2005), pp. 208-340, but Dra Fernández-Ochoa’s webpages would seem to be a good place to find more. That does of course rely on the assumption that she is not, contrary to what some people think, involved in the suppression of pre-Roman evidence from these areas so as to promote, “un pasado romano hipertrofiado por cuestiones políticas”. If you are concerned by that possibility you probably ought to follow the link; I’m not in any position to judge from here. 3. If you want an actual academic reference here rather than links to other blogs, no matter how authoritative they be, I offer you Karl Hauck, “Der Missionsauftrag Christi und das Kaisertum Ludwigs des Frommen” in Peter Godman & Roger Collins (edd. ), Charlemagne’s Heir: new perspectives on the reign of Louis the Pious (Oxford 1990), pp. 275-296, which manages with startling ease to be more relevant to this question than you would imagine from its title. 4. I’ve given all these references before, but because it was a dig worth reading, I’ll do so again: Leslie Alcock, Dinas Powys (Cardiff 1963), rev. in idem, Economy, Society and Warfare among the Britons and Saxons (Cardiff 1987); see also idem, Kings & Warriors, Craftsmen & Priests in Northern Britain AD 550-850 (Edinburgh 2003), pp. 209-210. I expected that the end of teaching would free up some time, but somehow before Kalamazoo I still have to finalise a paper for print, write another one for Kalamazoo itself, fend off my book’s editor with answers to a range of queries, apply for twoa jobs and stay employed in the current one. So content may be a bit thin here for a while. For the moment, therefore, I offer the tried and trusted bullets inspired by recent reading! Also in that volume, apart from the edition of the Vita sancti Marcelli I mentioned last post and the excellent Jane Martindale article I actually got the volume out for, is a lengthy article by Hans-Werner Goetz about the ideology of the investiture controversy.2 Meanwhile, in a different book that I had out for an excellent article by Jinty Nelson, I find another paper by Hans-Werner Goetz.3 The former is about fifty pages of elaborate German in a style I’ve mentioned here before, in which sentences take up four or five lines of print and contain eight clauses and at least four compound nouns I’ve never seen before; the latter is English, clear and only slightly literary, and is fourteen pages including tables, albeit that is on the long side for the volume. I’m not entirely sure there aren’t two Hans-Werner Goetzes (Goetzen?) who write in one language each. While I was still teaching I had to deliver a lecture on art and architecture, about which I had a rough idea due to how much I’ve wound up reading about Romanesque churches, but where some orientation seemed like a good idea, and so I fished out of the library the only likely-looking thing, Art of the Middle Ages by Janetta Rebold Benton.4 While this was up in the Currently reading… sidebar section there I had it linked to a fairly negative review by Joanna F. Ziegler, which describes it as, “a quite staid reiteration of the voluminous, but uninspiring, factual minutiae that has permeated the genre”.5 And, well, yes, it’s not deathless prose and does tend to take one or two exemplary objects or sites per trend, briefly explain them and then list all their siblings. But I’m still thinking about getting a copy, because what that tendency makes it is a volume to look things up in when you already know the basics. Inspiring read? No. Handbook with which to hit up Wikimedia Commons for high-class imagery? Absolutely. Its own plates are also rather lovely. And the final chapter on art in everyday life nearly makes up for the high-culture architectural concentration of much of the middle. 1. H. Atsma, “Klöster und Mönchtum im Bistum Auxerre bis zum Ende des 6. Jahrhunderts” in Francia: Forschungen zur westeuropäischen Geschichte Vol. 11 (Sigmaringen 1983), pp. 1-96, quote from pp. 54-55. 2. Referring to, respectively, François Dolbeaux, “La vie en prose de Saint Marcel, Évêque de Die : Histoire du texte et édition critique”, ibid. pp. 97-130; J. Martindale, “The Kingdom of Aquitaine and the Dissolution of the Carolingian Fisc”, ibid pp. 131-189; and H.-W. Goetz, “Kirschenschutz, Rechtswahrung und Reform. Zu den Zielen um zum Wesen der frühen Gottesfriedensbewegung in Frankreich”, ibid. pp. 193-239. 3. Respectively J. L. Nelson, “Gender and Genre in Women Historians of the Early Middle Ages” in J.-P. Genet (ed. ), L’historiographie médiévale en Europe : actes du colloque organisé par la Fondation européenne de la science au Centre de recherches historiques et juridiques de l’Université de Paris I du 29 mars au 1er avril 1989 (Paris 1991), pp. 149-163, and H.-W. Goetz, “On the Universality of Universal History”, ibid. pp. 247-261. 4. J. Rebold Benton, Art in the Middle Ages, World of Art (London 2002). 5. Joanna E. Ziegler, review of ibid. in The Historian Vol. 66 (Tampa 2004), pp. 179-180, quote from p. 179. 6. Miquel Sants Gros i Pujol, “Làmines” in Eduard Junyent i Subirà (ed. ), Diplomatari de la Catedral de Vic, segles IX i X, ed. Ramon Ordeig i Mata (Vic 1980-96), làm. 22. Anyone wanting to work on this stuff probably ought to start with Rafael Conde Delgado de Molina and Josep Trenchs Odena, “Signos personales en las suscripciones altomedievales catalanas” in Peter Rück (ed. ), Graphische Symbole in mittelalterlichen Urkunden. Beiträge zur diplomatischen Semiotik, Historische Hilfswissenschaften 3 (Sigmaringen 1986), pp. 443-452, which I have to admit I haven’t. Maybe in July. Burgundian royalty, right, they didn’t worry about the proprieties so much. I have lately met in the Vita of Saint Marcel of Die a story which, because of the lengthy and elaborate post-Roman Latin, I shall not give in translation.1 Instead, I shall paraphrase. Queen Carathena of the Burgundians has proudly built a new basilica to Saint Michael Archangel in Lyons, and gathers ecclesiastics from all round to dedicate it. Bishop Marcel, renowned holy man, miracle athlete and of course good friends with the queen, figures that this is an ideal time to ask her to ask her husband King Gundobad if something can’t be done about the tedious royal services the city of Die has to render to the Burgundian ruler. Gundobad, however, is unmoved by the queen’s entreaties, or even the bishop’s own ‘familiar’ address on the subject,2 but so as not to appear unbending on the subject, gives the bishop a small manse on his route back home so that he has somewhere to stay en route.3 While Marcel is staying at his consolation prize, one of the queen’s favourite slave-girls is possessed by a demon,4 and rages wild in a sleep from which she cannot be woken. But wait! Marcel appears to the queen in a vision and promises the queen that he will heal the girl, and makes as if to mop her limbs with his clothing. When the queen herself awakes, she hies off to the house where Marcel had stayed in Lyons, hoping that some fragment of his clothing has been left behind. Triumphant, she comes away with a handkerchief with which she has wiped up some sputum the holy man of God had hawked onto the wall, “not made in the filth of drunkenness but in the most worldly chewing of fasting”, and lets it soak in water with which she then washes the girl’s nose and mouth. Once suitable entreaties are offered up to God, she soon recovers.5 When this news is passed to the king, of course he realises the true holiness of Marcel and grants him the tribute exemption he’d originally been after, after which the girl mends enough to eat. A miracle! 1. Paraphrasing from a scratch translation of the text in François Dolbeaux, “La vie en prose de Saint Marcel, Évêque de Die : Histoire du texte et édition critique” in Francia: Forschungen zur westeuropäischen Geschichte Vol. 11 (Sigmaringen 1983), pp. 97-130, cap. 9. 2. Even in the Latin this reads as if the bishop patronised the king rigid about the importance of being nice to bishops from good senatorial family. One can understand how Gundobad wasn’t persuaded. 5. Whether from the possession or the treatment isn’t actually clear in the Latin. One of the nice things about Catalonia as a study area is that they have that provincial thing of pride in the ‘monuments’ of their local history on a national scale. There aren’t very many chronicles from as early as I work, indeed ‘none’ would be a fair summary, so the history has to be done from smaller texts. And the scholars of the area have risen to that challenge. Thus, an awful lot of the copious documentary material from my area and period of study is in print, and without that fact I could never have done my thesis. In 2001 Adam Kosto and Paul Freedman put a bibliography of this material online, but so much more has come out since then. There are two particularly important series for my line of work. More important, but as yet lacking crucial volumes, is the Catalunya Carolíngia, which aims to get all the documentary material from the old Catalan counties from before 1000 into print. This has been going since 1926 but in recent years has been given a real shot in the arm by the tireless work of Ramon Ordeig i Mata, who has in some measure or another seen seven of the current twelve volumes to press since 1998. Then, there is the Diplomataris series by the Fundació Noguera, which is instead working archive by archive, and currently stands at forty-four projects. Between these two there isn’t much not covered, which makes my life a lot simpler (and the bits that aren’t covered that much more tantalising). The Catalunya Carolíngia did however rather start with the fringe, the almost-in-Aragón counties of Pallars and Ribagorça and then the frontier ones of Osona and Manresa… The heartland was effectively missing until Girona was covered in 2003, and the volumes for Barcelona, which is naturally where a vast proportion of the material comes from, are still in process. The Fundació Noguera has however stepped up to this gap, covering the comital archive in 1998 (up to Ramon Berenguer III; when I last saw Professor Gaspar Feliu he told me that the next set of volumes is well-advanced) and a variety of the smaller ecclesiastical archives before and after. The Arxiu Capitular, in the cathedral, which is arguably the second most important if not the first, had meanwhile set out on its own with a first volume covering the ninth and tenth centuries in 1995, but more recently appears to have decided that this was not the way to go and has arranged that subsequent publication of its documents should be done via the Fundació Noguera. Consequently, the five volumes covering the eleventh century, edited by Josep Baucells i Reig with a wide range of assistance, came out in 2006 under their auspices, and now, I am informed by a post at Joaquim Graupera’s Maresme Medieval about the Fundació, they are available online for free as PDFs. And they’re not the only ones! The new volume covering Sant Joan that I mentioned here is there too, so is Jordi Bolòs’s for Serrateix and a number of others that may interest you (you know who `you’ are). I don’t know what their business model is here but I hope it continues, as this sort of generosity deserves to be rewarded!